Wensleydale lies within the Yorkshire Dales National Park and the River Ure runs through the valley for 74 miles from its source at Ure Head on Abbotside Common in the Pennines into the River Ouse at Cuddy Shaw Reach near Linton-on-Ouse, North Yorkshire where the river changes its name to the River Ouse. Wensleydale is perfect walking country with many way marked footpaths and open landscapes giving spectacular scenery all year round. Wensleydale is also renowned for hill farming, rearing many types of Sheep and cattle and the meadow grass for hay and silage is vital to the system. Its industrial past was water powered mills at Gayle, Hawes, Bainbridge, Askrigg, Thoralby, West Burton and Aysgarth which were variously used to grind corn, produce textiles (wool, cotton, linen, silk and flax), generate electricity or saw wood. The River Ure is a typical clean river of the Yorkshire Dales National Park and is rich in wildlife, insect life and many species of birds. Fishermen love this river for its brown trout, grayling and it also has the nationally rare native white-clawed crayfish. Askrigg is a lovely little village in Upper Wensleydale in the Yorkshire Dales National Park. It has cobbled streets and a typical North Yorkshire rural charm and is the village where the famous television series “All Creatures Great and Small” was filmed in the 1970s and 1980s. The King’s Arms became the setting for the Drover’s Inn and one of the lovely houses in the village was used as Skeldale House the home and surgery for the fictional Dales vet James Herriot. The stone cottages and the two and three storey stone houses that line the long main street through the centre of the village are 18th and 19th century were once famous for its clock makers. The Church of St Oswald, the market cross, a stone pump and an iron bull ring set into the cobbles can be found in the old cobbled market place in the centre of the village. The ground on which the 15th century church stands has been consecrated as a place of worship since around 1180 and the first priest was appointed in 1200. The market cross was erected in 1830 and the bull ring dates from the 18th century when bulls would be tied here and then attacked or baited with dogs. Askrigg also houses Sykes Country Store a shop and newsagents, Sykes Tearoom, The Village Kitchen a delicatessen, a florist and three pubs the King’s Arms, The Crown Inn and the White Rose Hotel. All three pubs serve bar meals and the King’s Arms also have a restaurant. The Kings Arms was built as a coaching inn in 1767 by a local who made a fortune as a jockey and the Crown Inn has been known under this name since the late 18th century. Askrigg was also the home of the Wensleydale Metcalfe family who lived at Nappa Hall where Mary Queen of Scots was once imprisoned possibly before she was moved to Castle Bolton further down the dale. The village had a railway station from 1878 to its closure in 1954 and the Wensleydale Railway Association has plans to rebuild the railway from Northallerton to Garsdale including the reopening of the station in the village in the period between 2010 and 2014. Sykes House once a Temperance Hotel and the Wesleyan Chapel now Bottom Chapel are today B&B’s. 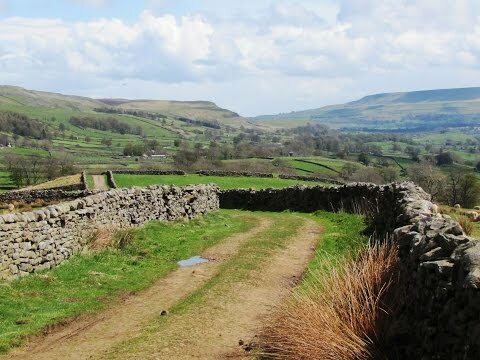 Askrigg is a wonderful place for walking for all the family from easy to the more strenuous depending on ability. There are many beautiful waterfalls in and around Askrigg the most famous being Aysgarth Falls. The nearest waterfall is Mill Gill Force hidden in a secluded pocket of woodland less than a mile from the church and is named after the mill which stands half a mile downstream. The water crashes over the rocks dropping 25 feet before it seems to split into three and then drops again for about another 3 feet. Whitfield Gill Force just over half a mile from Mill Gill is a rugged boulder strewn gill with a drop of 25 feet. The view of the fall at the end of the path is obstructed by trees and to get a better view you will need to scramble down a steep slope not very safe after rain. We park at the church and take a look round Askrigg before taking the small road to the left of the church. We pass West End and the school and at the end of the road we take the footpath on the right through the gate signposted Mill Gill. We follow the stone slab path across the field and go through the gate to the right of a stone barn. We turn right and go under a small aqueduct then over the bridge, through the gated stile and turn right. We head forwards and go through the gated stile opposite into the wood. We follow the wall on our left with the river down below on our right. Then we take the footpath on the right signposted Mill Gill only. We head down to the waterfall then retrace our steps back to the signpost and turn right to continue on the footpath, we were on, still following the wall on our left. We come to a signpost Whitfield Gill and go through the gated stile into a field. We cross the field following the wall on our right and go through the gated stile in the corner and turn left following the signpost for Whitfield Gill, the wall now on our left. We go through a gated stile into a field and head to the right hand corner to go through another gated stile. We head forwards crossing over a little stream go over a stile and follow a wire fence on our left. At the signpost we take the left path uphill and head forwards until we come to Whitfield Gill Force. We again retrace our steps back to the signpost then turn left downhill to a small waterfall where we cross the bridge and head uphill. At the top we bear to the left following the path with the wall on our right and we get a glimpse of Whitfield Gill Force on our left. At the wall corner, almost level with the waterfall, we bear right to go through the wall to the right of a seat. We now turn right and head forwards down the walled track (Low Straights Lane) sign posted Askrigg 1 mile. When we reach a stream over the track with a footbridge on the left we turn right through the gate with a sign on the stone gate post Askrigg ½ mile. We head forwards through the field going through a gateway at the side of a barn. We follow the stream on our right downhill through a gap in the wall then head forwards and take the track to the left of a barn and bear left over a stile and keep following the track. When we reach the road we turn right and follow the road back to the church in Askrigg. This is an easy walk on good grass footpaths and tracks with some small inclines and declines. Approx 3.25 miles allow 1½ hours using OS Explorer Map OL30, Yorkshire Dales Northern and Central areas. Askrigg, Wensleydale in the Yorkshire Dales. From the A1 take the A684 to Bedale. At the cross roads turn right still on the A684 to Layburn. Turn left at the roundabout still on the A684 through Wensley, West Witton, Swinithwaite and Aysgarth continue for approx 3.5 miles taking the next right through Worton after a mile turn left at the t-junction into Askrigg. At the next t-junction turn left and the church is opposite the bend. Askrigg can also be reached from Bainbridge and Hawes. Parking: At the church with an Honesty Box, car park and on the road side. There are public toilets including RADAR facilities in the Village Hall and the next nearest ones are in Hawes and at Aysgarth Visitors Centre. For refreshments there is a tearoom, delicatessen, shop/newsagents, and three pubs, the Kings Arms and restaurant, the Crown Inn and the White Rose Hotel all serving bar meals. There are many more shops and eating places in Hawes.